Welcome back to Louisa Unscripted, my newsletter where I share ups and downs from the life of the authors. You get a glimpse into my universe, a little bit of magic in an everyday life. First of all, the second book is Michael’s. Michael’s More will be brought to you early December. It’s already written and now sitting with my proofreaders. Michael is Cooper’s right hand, old college body and also member of the band. Michael is a happy-go-easy fellow, I fell so much in love with him, because he has chosen happiness as a way of living. His better-half is struggling a little more, but Louisa has her reasons. The third book is Cory’s, the third member of the band as well as Cooper and Michael’s college friend and now also lawyer. His story is on my mind ALL THE TIME these days because I’m writing. His happy-ever-after comes with a history and it’s unfolding as we speak in my mind and is coming to live. A little farther down I’ll share a “naughty” cut-out from this book. The fourth and final book in the guys’ stories is a side-character and a sort of a spin-off, but one day these characters sprung on me and demanded their story. It may sound insane, but a lot how it is, when I write. 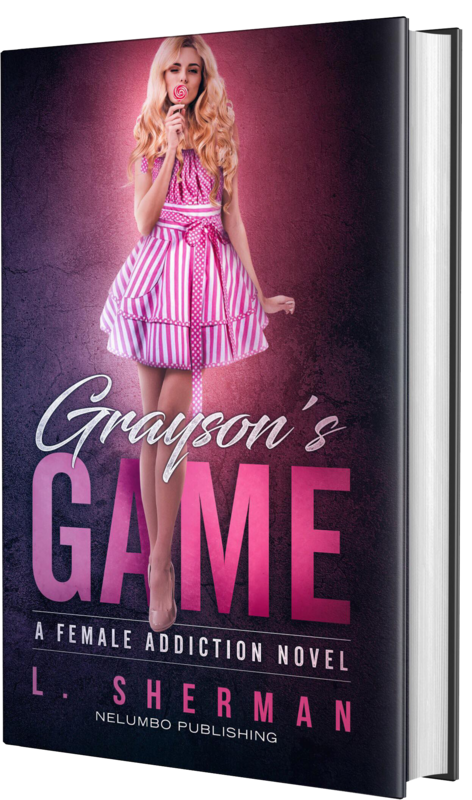 New stories demand their space when I’m writing someone else’s 😉 In this book we meet Cory’s little sister, Grace who’s grown-up and in grad school where she meets a mystery bad boy. I’m not going to divulge more, because this is epic. Let’s talk a little bit more about some of the more prominent side characters. When I’m through writing the guys’ stories we will move on to the women’s. Indy’s best friends Dani and Anna will get theirs first and finally Carmen and her fair Scottish man. Dani is the owner of the lingerie company Indy models for on the side. 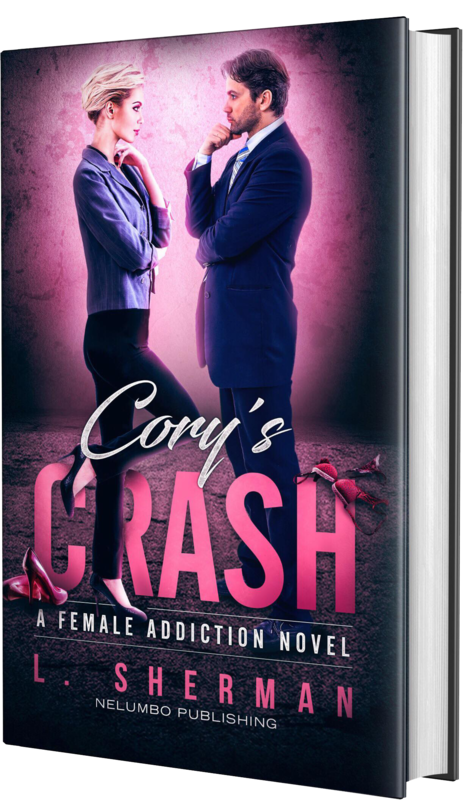 Her husband and her met under dark circumstances but in Cooper’s Craving they seem as your regular happy new family. Nothing is as it seems on the surface, we all bear our stories with us. Anna is Indy’s roommate and goes and falls in love with a Londoner. She’s a prima ballerina and Radford a business man. How will their worlds mix? As you can see I’ve got my writing planned and I simply love it. Writing is a passion and diving into each book, the scenes, and plot makes me so happy, which it’s all about. But, but, but I’m also a creative mind and don’t like being locked down at least not too much. There will be room for venturing out to the sides in between. 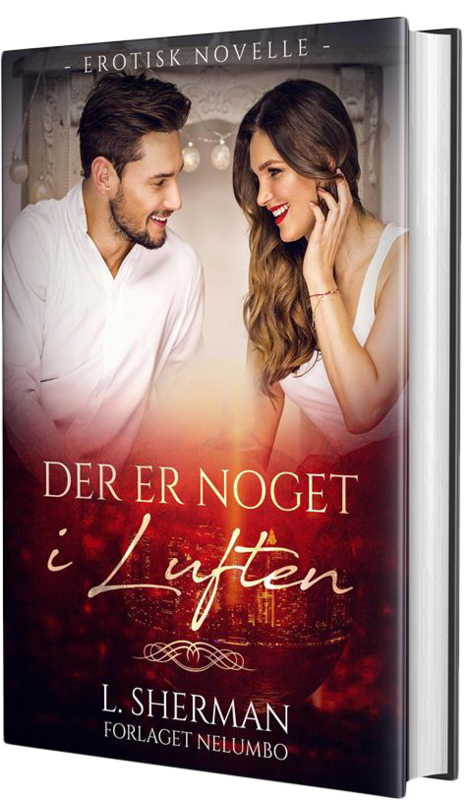 As an example, I was challenged to write a Christmas Novella in Danish, which I’ve done and am now translating to English. I want you all to have it come December. The stories flow better for me when I write in English and the search for words is less of a struggle. There will be other surprises as I go on my writer’s journey. For my dear BETA, PROOFREADS and ARC readers I’ve created a Facebook group, Louisa’s ARC where I share upcoming news and information about the progress of the novels, ask for advice, help, support and feedback. If you are interested in contributing, don’t hesitate to write and let’s have a talk about it. I’m so grateful for the community that’s being built, and I couldn’t have done any of this without you. If you have a book club, a reading circle or are simply just interesting in learning more about my books, characters or writing in general, you can book me on my website. I will read for you from my own books but also from novels through time that have inspired me. It can be romance, but I’ve devoured all genres and all types of writing and storytelling inspire me. During the practical workshop we will dive into writing and storytelling. You may ask yourself how I know anything about this? I may be a new author, but writing is not new to me. I’ve got a bachelor and master’s in communication and languages. I’ve worked with HR and communication since 2003 in corporate companies. Today I own my own HR and communication agency. The aspiring author was bubbling in my stomach for so many years but between work, kids, husband and everything, I didn’t make it a priority until last year. I’ve held a number of training and workshops during my career and love to teach and interact. My approach is very hands-on, and you will leave the workshops with a product of your own hands. Workshops and Cozy Reading are held either in Danish or English. Writer L. Sherman will take you through her universe of characters, places, inspiration for her current writing as well as new book projects. She will expand on the stories already written, read out loud if you wish and discuss the plots, twists and turns she develops. Are you an aspiring author and would you like to get your writing career kick-started? Writer L. Sherman will give you her insight and ideas. Another truth about me is that if I could travel for a living and I didn’t have family commitments I would. It is a given. I grew up with a single mom who would rather spend her savings on travelling than on new things for the home. We didn’t miss a thing and we were enriched with so many impressions from other cultures, people and their ways of living. I’ve lived in the US and France, two very different experiences. Today I travel with my family primarily for leisure. In my previous career I travelled with my job to destinations in the US and Europe. This Wednesday we’re going to New York more specifically Manhattan primarily. It’s the first time for our girls to visit The City That Never Sleeps, and I can’t wait to show them around. I’ve completely fallen in love and lost my heart to this big boisterous city. I’ve you follow my social media I will post from a number of locations that you may recognize from the book. Another purpose is to sample inspiration for the future books what a chore. 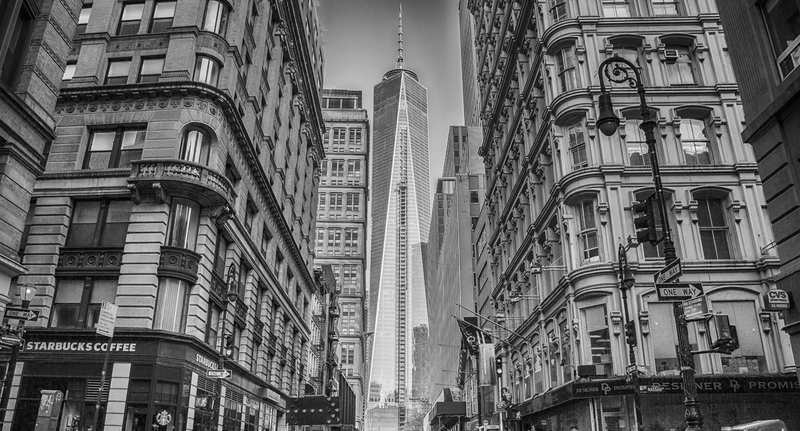 We will be staying in midtown for the first part of the trip and the last few days on lower Manhattan right on the water. I’m utterly and completely lost in Cory’s Crash these weeks. I dream about him and his Natasha. They wreck my heart, which is so hard and at the same time healing because their destiny is in my hands and I want them the best. When I write I compose the playlists that will be the underlying music to the stories. A particular scene or ambience has its own music and the playlists are already live for the next 2 books. You can find them on Spotify. Right before release I will clean them up a bit, they’re part of the process but will maybe be too long and some of the songs will probably not match the final feeling of the books. I promised you an excerpt from Cory and I don’t know if it will make the cut. I wrote a scene for the first part of the book and then I didn’t need it. I haven’t read a lot these past weeks due to the release of Cooper’s Craving and writing the next book. I’m missing it and am certainly looking forward to a long flight with lots of new titles on my e-reader. Here are the titles on my e-reader currently waiting to be explored. Maybe you too can be inspired. And second it dawned on me that I read in a certain way. When I find a new author, I want to read everything he/she or they have released. Just an example is the writing duo Kennedy Fox. I’ve binge read all of the Bishop Brothers in almost one sitting, just coming up for air to feed my family and take a shower, I’m almost not kidding. 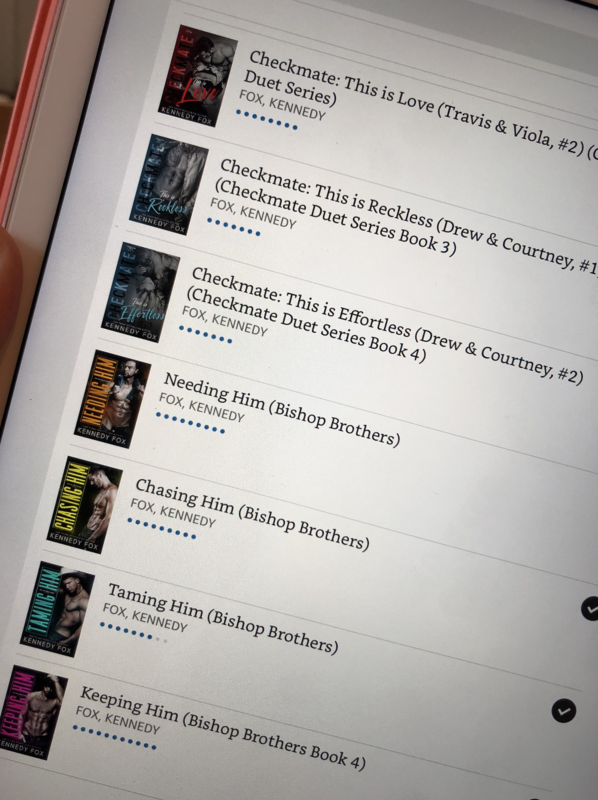 To be honest I read the Check Mate series first some years ago, but when I discovered the Bishop’s I re-read Viola and Travis and literally ate all the books that were out by the authors. Music always music, but also dancing, travelling, art, work, people I meet and life. This song, “As I lay me down” by Sophie B. Hawkins is haunting me, and I’ve been listening to it on repeat writing a special scene for Cory’s Crash. I’d almost forgotten it existed, which is another benefit from listening to music and using it as an inspiration, you get to relive and rediscover beautiful tunes.